Rebel Heart Annotations, 3 of 3. –Retroactive! I confess, when I got to this part in the outline, I needed an excuse for Edsel not to be available—one Calvin would accept. That would mean going back and establishing something. A pox seemed like the way to go, so I had Shantewa Goodall talk about it. Then came the discussion on quarantines and the like. Combined with the abrupt nature of his dispatch, Calvin would just go with it and follow orders. -And that’s how the McCrackens got rid of him. –Misfortune. When his muffler blew, that was just bad luck. Or perhaps, in the grand scheme of things, it was an act of divine intervention? Imagine how different this book—and its sequels—would be if Calvin hadn’t attracted the attention of the mages down below? –A million uses. Yes. Calvin used duct tape on his muffler. ‘Merica. –Centerpiece! The two-page spread of Calvin flying away is easily the best drawing of the book. When we first scanned them in, most of the drawings looked like crap, and this one made me the saddest. Fortunately a Sharpie treatment and a re-shoot solved the problem, and it looks better than ever. –Light values. The drawing with the grenade going off was one of the harder pieces of this book. Keep in mind that I illustrated the whole thing with mechanical pencils and a crappy No. 2 for heavier shading. I foolishly thought it would be enough from the outset, and learned otherwise by the end. Still, even with a good set of graphites or charcoals, this would have proven difficult for my skill level, as I had never given so much attention to a light source in a piece before. I really had to think in layers and shadows, as I was considering Calvin in the foreground (behind a tree), Birty and Godfrey in the clearing, and the depths of the forest beyond them. The grenade blast would yield a slight, rapid burst of light, and would cast sudden shadows outward in all directions. I’m pleased with the overall effect, even if I had to lighten Calvin a little bit for him to show. –FINALLY. Also, this is the chase scene that originated in the web serial that I wrote in 2011. The scene with the grenade was there too, except Leon (Calvin) killed two mages with the grenade and shot the third with his blunderbuss. That made, Troy (Godfrey) had wrapped himself in his flying carpet and fortified it with an armor spell, so he survived. Leon knew Troy survived, but fled anyway. Like I said, I wrote those scenes in a flash to get them on the site; flaws like this were why I stopped writing it. -But, as with the grenade drawing, I’m pleased now with the result. It was all grist for the mill. -Dialect and vocab were important too; Calvin was a working-class bumpkin with a narrow education, while Godfrey was just posh enough to expect better things out of life than what he had. –So begins the hunt. Because Godfrey’s purpose in the story is directly connected to Calvin, it was easy to paint his ambition, his motivation, with such energy. He is a villain truly defined by the hero. As we learn that Baltimore has changed since Calvin stood up to Fitz and Birty, Calvin becomes more than just another technomancer recruit. There’s a price on his head, so capturing him would be symbolic. And Godfrey needs a symbolic win. Thus, their rivalry is born. –Yet another antagonist. Edsel wasn’t a malicious antagonist for Calvin. Godfrey was, but he wasn’t an immediate threat. This is where Hamilton comes in, someone malicious and immediate, to give Calvin a new challenge. Most of that challenge comes to a head in SUICIDE RUN. The reader is meant to truly hate this man, the insane captain of the TechMan army. He’s not at the top of the food chain, he’s just in very good graces with the people who run the show, so that gives him leeway. You’ll also learn in book two that Hamilton was essentially a child soldier, having joined up at age 9. No matter your army’s cause, putting a kid into a war is only going to wrap his brain in layers of psychosis. The army doesn’t have psychological practitioners; figures who have endured the life that Hamilton has lived, well, they just become what they become. He’s functional, even rational, he’s just not moral. –How can I kick you in the groin today? The plot twist that comes about in this chapter was a very seat-of-the-pants decision that I made when writing the web serial. Like I said, I had the vision of a guy flying on a dragon-machine through the midnight woods. He’s cornered by wizards. He fights them off and keeps going. For a while you see some Godfrey chapters (including scenes from what became book two). Then Calvin reaches Camp Liberty (then it was League City in Texas; I had to change it to Ohio for the reboot, because in this story Texas is still a contested space belonging to Spain.) It’s only at Camp Liberty that he realizes he was duped by Old Man McCracken, without immediately knowing why. In the original, the reason was still Amelia, but the conflict with the McCracken boys hadn’t come up yet. –Foreshadow…The chase scene with the emergent gryphon mimics was also a holdover from the serial, but they weren’t manned by the recruiters who had brought Calvin in. That just hadn’t been established. When drafting this version, I wanted Calvin to cross paths with them for a moment, to keep them relevant. It won’t be the last time they run through the ruins of Youngstown..
-Hank Duncan? T.Y. Hilton, wide receiver, Indianapolis Colts. -Hank’s character was originally named Paul. I thought it was too generic, so I changed it. –Be careful what you drop. The emotional imprint spell that Godfrey uses was another holdover. However, it only put him on Calvin’s trail in the beginning. Then he lost the trail, so he took the dregs of the spell to a blood magician, who was able to put a stronger trace on him. That character appears in book two, and with a much, much more intense role. So there you have it: a deconstruction/behind-the-scenes look at the Engines world and the characters in it. Once I’ve annotated SUICIDE RUN, I’ll post those notes here. Rebel Heart Annotations, 2 of 3. -At first I based Amelia off of my friend’s teenaged daughter. That quickly had to change, because the girl always had the same smile on her face no matter what. Soccer, dance, sleep, funerals, whatever. That change didn’t come about until the next book, though. –Fleshing out the female lead. Writing Amelia was a very smooth and natural exercise. She just jumped onto the page, fully developed. The first hard part came when I tried writing from her point of view in SUICIDE RUN. When Calvin describes her, she’s flawless, but in her own mind she knows she has weaknesses. I like how that worked. –Remember, this is fiction. If the recruits are training in three weeks, it makes sense that they’d do actual combat maneuvers in three days. Right? Right? Oh, the power of suspended disbelief. -That mage that gets blown away? John Cleese. Note: frosted iron knives are used for the first time. The fabrication device for those things is probably one of the highest levels of technology in the Engines world. I intentionally added krypton to the process, for reasons of general Superman fandom on my part. –Consequences. I couldn’t just glaze over the fact that Calvin had killed a man. While it doesn’t dominate his every waking thought after that, it does strike him at the proper moments. It was too important a detail to leave out; while this is an America more accustomed to the hard side of life, where most people have killed their own food at one point, it would have been easy to say “Oh, they just take life if they have to.” But that would have meant Calvin esteemed certain people the way he esteemed livestock…and that wouldn’t make him any different from the mages, in some contexts. –Heating up. Also, I wanted to strengthen Calvin’s connection to Amelia. They were bound to have a romance, so the link needed some meat on its bones. The pantry scene got them alone, working together, so it was a step in the right direction. -Rockefeller was Robert Picardo. Fitting, as he’s the Doctor from Star Trek: Voyager. -Goodall is my sis-in-law Shantewa. -Whitney’s physical description is based on Paul Teutel Sr. of American Chopper fame, but his demeanor and skillset are based on the father of a childhood friend, who owns a tow truck company in the Vegas area. –Rivalry. Stepping up the competition between Calvin and Edsel was also important. Basically whenever Edsel was talking, he needed to be full of himself. His rivalry with Calvin would push them both to be better. My editors at first referred to Edsel as the “Malfoy” of my trilogy, so I had to tone him down and make him more self-absorbed than deprecating. He and Calvin could have a rough dynamic at first, but I didn’t want it to define their contrast too sharply. –Outdated. The warg mimic was an idea that I had so I could show older mimics that had been phased out for their flaws. Flying mimics of various models were much more useful. Still, I thought it was worth exploring. –Prize piece. I’m proud of all of the technopunk things I came up with for this series, but I’ve given myself many pats on the back for engineering the flight simulator. I put a good amount of thought into it, and I daydreamed about it often. It came together really well and it was a good tool for Calvin to use so he could improve himself against Edsel. –Giggity. The gryphon attack solved a few problems at once: show that Mount Vernon, the stronghold of the technomancer rebellion, is not immune to magical surveillance; and get Calvin and Amelia alone in such a way that it strengthens their attraction while earning Calvin more scorn from the McCracken family. -If Jack Badgett is anyone, he’s Tom Cruise from Top Gun. I may yet write a standalone novel about his adventures down the road. It was fun to have a little propaganda icon for the young mimic pilots to idolize. –Transcendent emotion.Without getting into all of the gory details, I feel like this scene came together tremendously well to illustrate a lot of things: fear of the really skilled mages, fear of sickness, fear of painful curses, that the technomancers have their own hero culture, and that Calvin (as well as Edsel) does not care about getting in trouble, not even with a mimic. This leads to one of my favorite exchanges in the book: Calvin and Edsel’s punishment. -Peter McCracken is based on a young Wil Wheaton. –Big kitties. I wrestled with the decision to call the big cats “painters” instead of “panthers.” While there are big gnarly tree cats in the woods of the eastern US, they’ve had different names at different times throughout history, and in an effort to give the series a colloquial flare, I went with “painter.” It painted the right kind of picture. –Poultry. My wife has never hunted turkeys so I can’t tell you if they really behave this way. Someday I expect I’ll get hate mail for this scene if I got something wrong. –Camaraderie. In a sense, this is the one chapter in the book where you see Edsel let his guard down and do something genuine. He does have a strong sense of self-importance, so putting him in a situation where he has to know that without Calvin he’d have been screwed, that gave me a chance to show his commendable side. His virtues. –NOW it’s getting steamy. The lavatory scene was not originally that enticing. When you have two women professionally editing your book, scenes like this will naturally end up with suggestions like “Take his shirt off” and “This needs to last longer” and “That kiss sucked.” So I turned up the heat a little bit. You’re welcome. Ladies. –Whence comest thou?! The defining scene of this chapter is the part where Calvin pulls a gun on Edsel. I’ve analyzed it and honestly I can’t tell you where it came from. Lots of portions of the book have a natural, progressive genesis; you tell me the instigating moment, I can walk you through the steps to its conclusion. But this…no clue. It’s just one of those moments where Calvin took on a life of his own and it felt right. I knew what kind of character he would need to be if he was going to survive the suicide run and play the patriot’s game. This was the result. –Self-control…for now. I also felt it was important to show a slight shift in Calvin’s maturity by giving Edsel the original dispatch to Camp Liberty. Three weeks of intense physical training has to have some degree of emotional and mental impact; for Calvin, he started to get a grip on his temper, and by extension, his jealousy. –Little did he know…What Calvin doesn’t realize is that the McCrackens are luring him into a false sense of complacency so that when they spring the real summons on him, he doesn’t overthink it; he just goes for it, post-haste, right into their trap. Rebel Heart Annotations, 1 of 3. As part of the outlining and writing process for the third Engines of Liberty novel, I’ve been annotating books 1 and 2 to make sure I keep the continuity straight and deliver on the promises I’ve made. I thought I’d post the annotations here in case anyone wanted to see how I built the world and planned the illustrations. A note on celebrity models for certain characters: while I did Google pictures of certain celebrities to use as models for the many characters in the Engines world, the annotations only name them for the purposes of showing the reader how each character came to look the way they did. I’m not actually marketing these characters as celebrities, actors, athletes, or what have you. No infringement intended, etc. Understanding this series requires that you understand its genesis. Here are the relevant parts. Sometimes my stories are triggered by certain visuals. I get an idea, I have to flesh it out and build a world and a story around it, and so I do. With the Engines world, I first had an image of someone in a fantasy story using math and science to build a crude mechanical replica of a dragon. They eventually got a motor and propellers in it and got it to fly. Someone else didn’t like that, so they came to destroy it. Thus, the first thing I imagined was a young man rushing to the barn on the family ranch, kicking the doors open in the middle of the night, firing up his dragon machine, and racing into the dark woods, where he was summarily chased by wizards on brooms. I wrote that scene a couple of times and soon started to “pants” a story about it. I set up a website where I would publish the story in installments of 1,000 words or so, accompanied by a crappy illustration in black and white. The story was called TECHNOMANCER. I made it about a dozen installments in before abandoning it for a time. Two years later, as other ideas bounced around in my head, the title “Engines of Liberty” came to mind, and I thought of the story I’d set up in TECHNOMANCER. That title was too generic, but the Engines one sounded cool. I revisited the archives of the online serial and started to make a new book, which I developed into a trilogy. There was plenty of work to do. For one, I had to come up with better character names. Calvin Adler and Godfrey Norrington were once Leon Jacobs and Troy Hampshire. (Gag me.) Those weren’t even the worst ones. To date, the only names that have survived the transition are McCracken and Hamilton. As I fleshed out the world and the story, it soon became clear that I couldn’t open up with Calvin jumping on the machine and flying into the woods. I needed to take several steps back and work my way up to that. Thus the story arc of REBEL HEART was born. –The first chapter is always the hardest one to get right, mainly because I feel like I get it right the first time—and I’m always wrong. 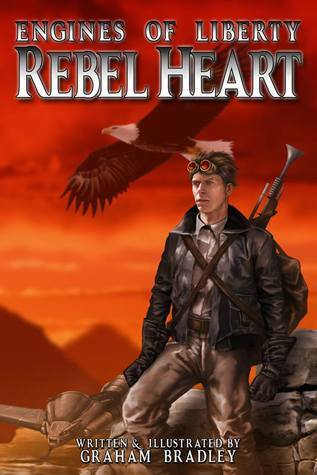 -In the first version, when Calvin soaks the mages with the bucket of dirty water, his immediate reaction is fear and regret and “Oh crap I shouldn’t have done that.” My brother, the Ph.D, pointed out that that was inconsistent with the character portrait I was painting of Calvin Adler, the American Rebel. It meant that his bravery was fleeting. Fleeting bravery does not pave the way for larger acts of bravery after suffering the consequences of a smaller act. I needed Calvin to tick off the mages and stand by his choice to do so. -The other oversight was pointed out to me by Emily and Holly, my editrices: for Godfrey Norrington, the mage who would become such a powerful antagonist by the story’s end, the reader needed a greater awareness of his presence. While I felt it would be jarring to put more “Godfrey” chapters in the midst of what is truly a “Calvin” story, I did go back to the beginning and add a snippet from his perspective so that the reader would more readily remember who he was when the time came. Both of these suggestions really improved the strength of the story’s beginning. -Note: I Googled a list of whimsical British names for pretty much all of the mages throughout the series. If I recall, I found a name generator of some sort and pieced together the names I liked, once that sounded sufficiently Anglo, all BBC and bowler hats and monocles and whatever. –The “Tanner’s/Adlers” piece: I used my brother-in-law Patrick as the model for Calvin. My other brother-in-law, Joseph, has been the main mold for Godfrey. It makes their conflict somewhat biblical in the end. As for Fitz and Birty, that’s author-illustrator-cartoonist-comic guru James A. Owen, alongside fantasy author maestro J. Scott Savage. They both have great talent, and I value their friendship quite a bit. That’s why their characters die such brutal deaths in this series. I finished this drawing on what would have been my Mamaw’s birthday. –The recruiters. Tim Thomas (goalie for the Boston Bruins), Forrest Griffin (MMA fighter), and Pat McAfee (punter for the Indianapolis Colts) provided rough models for the three recruiters. Using real people helps me to avoid drawing the same character over and over. -This drawing was finished on my mom’s birthday. –Propaganda. Including propaganda seemed like a no-brainer. Even for an historical fiction, it seemed to frame everything in the right time and place. Magic used: transfiguration, making vines appear, summoning spells, terramancy equations. –The general. A drawing of George Washington could only be an epic drawing for this book. Whether it was intended as exciting propaganda or not is up to the reader, but I wanted him reared up on a horse with a rifle in hand. –The others. The models for the young recruits are all listed in the acknowledgements of the book, so I won’t re-list them here. Three of them are my cousins, two are nephews of friends, and the last one was modeled off of teenaged pictures of my attorney. –Not an ogre. Sometimes I wonder if people will look at the propaganda rendering of King George and get the wrong idea, so here’s clarification: in the Engines world, King George is not actually an ogre. –Architectural adjustment. No way is Mount Vernon large enough to fit an amphitheatre of that size, along with all of the other stuff I cram into it as the series unfolds. It doesn’t matter. I don’t establish its finite dimensions in the series, as it’s unnecessary. I feel like I did a good enough job showing the reader what they needed to see as it goes. Established: the history of the first revolution. The Brits used propaganda against the colonials, and the fact that people actively resisted their own liberation brought Washington’s downfall. -Commodore McCracken is totally Jonathan Frakes. –Training camp. I’ve read a handful of military non-fiction from retired SEALs, so I got a sense of the toughness of their BUD/S training and the like. It’s insane. What the technomancers endure is maybe a tenth that difficult, because I didn’t want to overdo it, but I did try to capture that same sense of fatigue mixed with urgency. –Livestock. In the boar pen scene, the recruits originally had to run through a stampede of ornery cattle. My wife read that chapter and laughed it to scorn (she grew up on a dairy.) Ultimately I had to change “cattle” to something meaner and more prone to charging. –Desertion. Calvin making the choice to ditch the army was not one that I had originally planned on him making. He truly came alive for me in this chapter; he didn’t have the stomach to put up with other peoples’ crap, so he decided he was out, just like that. Of course, then the challenge became: how do I get him to stay?